Going to start a business in Bangladesh and don’t know how and where to start from? So, why don’t you read the entire article to know them all with ten more things you should know? You’ll find the stuff you should know along with some helpful tips to start your business. There are a lot of chances for small businesses and they’re very popular in Bangladesh as well. For the ongoing business in Bangladesh have so many positive feedbacks. It entails a lot to run a small business though. Besides, what you should know to be a success in a business is the proper route associated with some other initiatives that we’re going to talk about in the next topics. It’s important to keep in mind that you must need to do a lot of researches before you start a business. This is because there is no shortcut way to be a success in business. As it’s said that there is no shortcut doing a lot of studies if you want to get the success in a business. This content will help you much more if you’re planning on running your own small business in the sooner or later. In addition, you’ll need to make your statement clear to you and to your clients why they should use your products or services. So, you’ll need to have some homework to make you more confident. 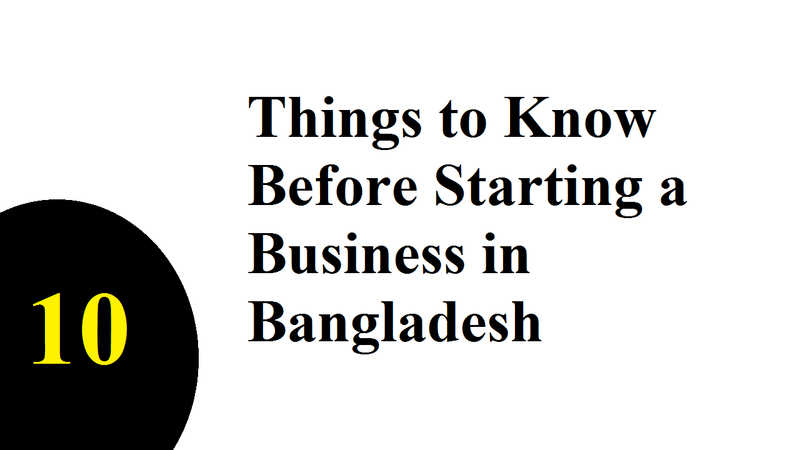 There are helpful tips about the things you should know before starting a business in Bangladesh to do so. Nothing but this is the first real step any entrepreneur or prospective business owner should take that the experts agree on note down the business plan. It forces real and tangible answers to important, and sometimes challenging, questions along with a true level of commitment. Also, the first thing any potential investor is going to request is a business plan. If you do things with a good plan, it’ll bring a full understanding of the business venture and the opportunities along with the owner’s level of expertise. Although it’s not always an easy thing to change after the fact, it’s important to know how a company is incorporated. Every type of legal entity comes with certain requirements and restrictions while not overly complex to understand. But, the types you’re looking for, they may not be available or appropriate for you. You’ll get some resources to assist with various things if you find and research. The things include filing incorporation paperwork, selecting business names, obtaining necessary licenses and many more. So, the local authority of the related business can assist in meeting the regulatory requirements for each locale around the country. When you want to come out with a better product or service, competition is nothing wrong. This is because it gives you the opportunity to come out with better in quality. It’s a critically important step in the business setup process to know your marketplace and what your competition is doing. You’ll need some help nailing down this part of your pre-business planning if you’re not an accountant, or have a degree in finances. You must list it, no matter where your revenue will come from. You have a chance to use your credit cards or home equity to start. Or, even it could be done by taking a loan. Also, share that information in your business plan, no matter how you propose to finance and fund your business. The logistics of your proposed business location must be firmed up before starting your business. There are some managing things such as business directory listings, choosing phone and internet service providers along with the lease or purchase agreement. As a deal breaker or red flag, the investors, bankers, and legal counsel generally don’t see the lack of a specific location. It’s important for your business to have access to a lawyer whether you are proposing to have in-house counsel. In this concern, you may need a lawyer with specializes in corporate, tax, intellectual property, labor, trial, or international law. So, it’s potentially your company and intellectual property in the long run wherever regulatory requirements demand compliance. If you want to that ensure your company is compliant, there are local and national resources to help you. They’ll help you, for example, to choose the correct legal structure, company name, loans etc. This requires a huge research or simply contacts a local lawyer for these issues. Run through it all one more time and this is the last things you should know before starting a business in Bangladesh, but not least one. So, it’s a great way to identify in omissions or areas that need to be modified along with this an excellent way to fully familiarize yourself with your proposed new company. The top of all is to deploy a second set of eyes.